$2,160 off MSRP! Pure White 2019 Volkswagen Jetta GLI 2.0T Autobahn 4D Sedan 2.0L TSI FWD 25/32 City/Highway MPGSince 1928, drivers have trusted, family owned and operated, Grossinger for all their car buying needs. We always offer our owners complimentary car washes, pick up and drop off of your vehicle (within local service area) for service and much more. Plus Grossinger will even deliver your new vehicle to your home or office. That's why for 90 years, customers say for great service, selection and always a low price, "You go to Grossinger." $3,701 off MSRP! Priced below KBB Fair Purchase Price! 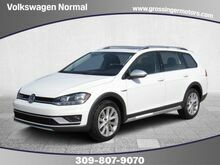 Pure White 2019 Volkswagen Golf Alltrack TSI SE 4D Wagon 1.8L TSI AWD 4Motion 22/30 City/Highway MPGSince 1928, drivers have trusted, family owned and operated, Grossinger for all their car buying needs. We always offer our owners complimentary car washes, pick up and drop off of your vehicle (within local service area) for service and much more. Plus Grossinger will even deliver your new vehicle to your home or office. That's why for 90 years, customers say for great service, selection and always a low price, "You go to Grossinger." $3,387 off MSRP! Priced below KBB Fair Purchase Price! Pure White 2019 Volkswagen Tiguan SEL 4D Sport Utility 2.0L TSI DOHC FWD 22/29 City/Highway MPGSince 1928, drivers have trusted, family owned and operated, Grossinger for all their car buying needs. We always offer our owners complimentary car washes, pick up and drop off of your vehicle (within local service area) for service and much more. Plus Grossinger will even deliver your new vehicle to your home or office. That's why for 90 years, customers say for great service, selection and always a low price, "You go to Grossinger." $2,315 off MSRP! Pure White 2019 Volkswagen Tiguan 2.0T SEL R-Line 4D Sport Utility 2.0L TSI DOHC AWD 4Motion AWD, ABS brakes, Compass, Electronic Stability Control, Front dual zone A/C, Heated door mirrors, Heated Front Comfort Seats, Heated front seats, Illuminated entry, Low tire pressure warning, Navigation System, Power Liftgate, Power moonroof, Remote keyless entry, Traction control. 21/29 City/Highway MPGSince 1928, drivers have trusted, family owned and operated, Grossinger for all their car buying needs. We always offer our owners complimentary car washes, pick up and drop off of your vehicle (within local service area) for service and much more. Plus Grossinger will even deliver your new vehicle to your home or office. That's why for 90 years, customers say for great service, selection and always a low price, "You go to Grossinger." $4,611 off MSRP! Priced below KBB Fair Purchase Price! Black Pearl 2018 Volkswagen Tiguan SEL Premium 4D Sport Utility 2.0L TSI DOHC AWD 4Motion AWD. 21/27 City/Highway MPGSince 1928, drivers have trusted, family owned and operated, Grossinger for all their car buying needs. We always offer our owners complimentary car washes, pick up and drop off of your vehicle (within local service area) for service and much more. Plus Grossinger will even deliver your new vehicle to your home or office. That's why for 90 years, customers say for great service, selection and always a low price, "You go to Grossinger." $3,602 off MSRP! Priced below KBB Fair Purchase Price! 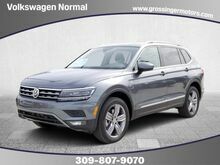 Platinum Grey 2019 Volkswagen Tiguan SEL Premium 4D Sport Utility 2.0L TSI DOHC AWD 4Motion AWD. 21/29 City/Highway MPGSince 1928, drivers have trusted, family owned and operated, Grossinger for all their car buying needs. We always offer our owners complimentary car washes, pick up and drop off of your vehicle (within local service area) for service and much more. Plus Grossinger will even deliver your new vehicle to your home or office. That's why for 90 years, customers say for great service, selection and always a low price, "You go to Grossinger." $4,932 off MSRP! Priced below KBB Fair Purchase Price! Pure White 2018 Volkswagen Atlas SE 4D Sport Utility 3.6L V6 AWD w/Technology and 4Motion 17/23 City/Highway MPGSince 1928, drivers have trusted, family owned and operated, Grossinger for all their car buying needs. We always offer our owners complimentary car washes, pick up and drop off of your vehicle (within local service area) for service and much more. Plus Grossinger will even deliver your new vehicle to your home or office. That's why for 90 years, customers say for great service, selection and always a low price, "You go to Grossinger." $3,928 off MSRP! Priced below KBB Fair Purchase Price! Deep Black Pearl 2019 Volkswagen Atlas SE 4D Sport Utility 3.6L V6 AWD 4Motion 17/23 City/Highway MPGSince 1928, drivers have trusted, family owned and operated, Grossinger for all their car buying needs. We always offer our owners complimentary car washes, pick up and drop off of your vehicle (within local service area) for service and much more. Plus Grossinger will even deliver your new vehicle to your home or office. That's why for 90 years, customers say for great service, selection and always a low price, "You go to Grossinger." $3,804 off MSRP! Priced below KBB Fair Purchase Price! 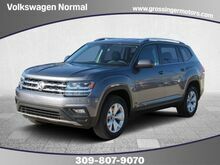 Platinum Gray Metallic 2019 Volkswagen Atlas SE 4D Sport Utility 3.6L V6 AWD w/Technology and 4Motion 17/23 City/Highway MPGSince 1928, drivers have trusted, family owned and operated, Grossinger for all their car buying needs. We always offer our owners complimentary car washes, pick up and drop off of your vehicle (within local service area) for service and much more. Plus Grossinger will even deliver your new vehicle to your home or office. That's why for 90 years, customers say for great service, selection and always a low price, "You go to Grossinger." $3,859 off MSRP! Priced below KBB Fair Purchase Price! Reflex Silver 2019 Volkswagen Atlas SE 4D Sport Utility 3.6L V6 AWD w/Technology and 4Motion 17/23 City/Highway MPGSince 1928, drivers have trusted, family owned and operated, Grossinger for all their car buying needs. We always offer our owners complimentary car washes, pick up and drop off of your vehicle (within local service area) for service and much more. Plus Grossinger will even deliver your new vehicle to your home or office. That's why for 90 years, customers say for great service, selection and always a low price, "You go to Grossinger." $3,824 off MSRP! Priced below KBB Fair Purchase Price! 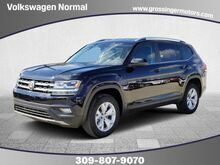 Blue 2019 Volkswagen Atlas SE 4D Sport Utility 3.6L V6 AWD w/Technology and 4Motion 17/23 City/Highway MPGSince 1928, drivers have trusted, family owned and operated, Grossinger for all their car buying needs. We always offer our owners complimentary car washes, pick up and drop off of your vehicle (within local service area) for service and much more. Plus Grossinger will even deliver your new vehicle to your home or office. That's why for 90 years, customers say for great service, selection and always a low price, "You go to Grossinger." $3,808 off MSRP! Priced below KBB Fair Purchase Price! Fortana Red 2019 Volkswagen Atlas SEL 4D Sport Utility 3.6L V6 AWD 4Motion 17/23 City/Highway MPGSince 1928, drivers have trusted, family owned and operated, Grossinger for all their car buying needs. We always offer our owners complimentary car washes, pick up and drop off of your vehicle (within local service area) for service and much more. Plus Grossinger will even deliver your new vehicle to your home or office. That's why for 90 years, customers say for great service, selection and always a low price, "You go to Grossinger." $3,955 off MSRP! Priced below KBB Fair Purchase Price! Fortana Red 2019 Volkswagen Atlas SEL 4D Sport Utility 3.6L V6 AWD 4Motion 17/23 City/Highway MPGSince 1928, drivers have trusted, family owned and operated, Grossinger for all their car buying needs. We always offer our owners complimentary car washes, pick up and drop off of your vehicle (within local service area) for service and much more. Plus Grossinger will even deliver your new vehicle to your home or office. That's why for 90 years, customers say for great service, selection and always a low price, "You go to Grossinger." $4,181 off MSRP! Priced below KBB Fair Purchase Price! Pure White 2019 Volkswagen Atlas SEL Premium 4D Sport Utility 3.6L V6 AWD 4Motion 17/23 City/Highway MPGSince 1928, drivers have trusted, family owned and operated, Grossinger for all their car buying needs. We always offer our owners complimentary car washes, pick up and drop off of your vehicle (within local service area) for service and much more. Plus Grossinger will even deliver your new vehicle to your home or office. That's why for 90 years, customers say for great service, selection and always a low price, "You go to Grossinger." $4,119 off MSRP! Priced below KBB Fair Purchase Price! 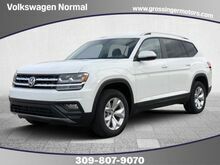 Pure White 2019 Volkswagen Atlas SEL Premium 4D Sport Utility 3.6L V6 AWD 4Motion 17/23 City/Highway MPGSince 1928, drivers have trusted, family owned and operated, Grossinger for all their car buying needs. We always offer our owners complimentary car washes, pick up and drop off of your vehicle (within local service area) for service and much more. Plus Grossinger will even deliver your new vehicle to your home or office. That's why for 90 years, customers say for great service, selection and always a low price, "You go to Grossinger."